GRAND RAPIDS, Mich. – As part of its commitment to corporate responsibility, SpartanNash is again proud to offer the Double Up Food Bucks™ program to Supplemental Nutrition Assistance Program (SNAP, formerly known as food stamps) customers at 17 Family Fare locations throughout Western, Southern and Northern Michigan in 2017. The Double Up produce incentive program is a public-private partnership pioneered by Fair Food Network. Today, Double Up programs are active in more than 20 states with support from federal, state and private sources. SpartanNash is the only major grocery retail chain in Michigan with multiple stores participating in the Double Up program. Double Up Food Bucks is also available in more than 200 farmers markets, farm stands and other retailers, as well as more than 40 full-service grocery stores, including many SpartanNash independent customers. For each dollar of fresh produce SNAP customers purchase using their Bridge Card and SpartanNash’s yes loyalty account, an equivalent amount of dollars will be earned and placed on their yes account. 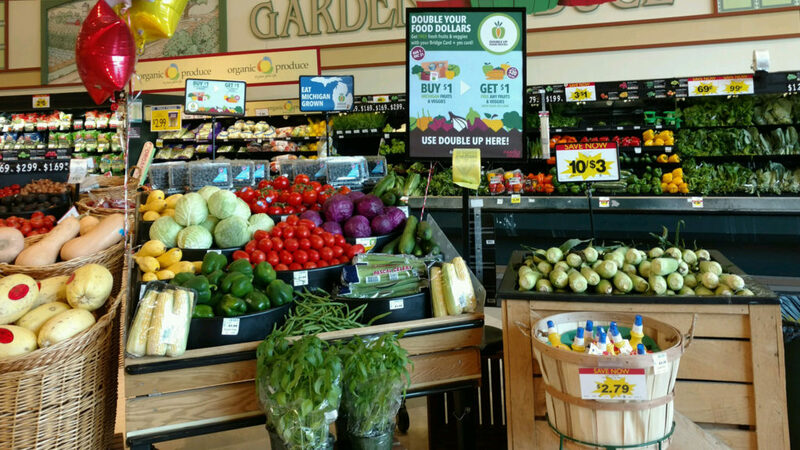 Shoppers can then redeem the Double Up dollars for free fruits and vegetables at participating Family Fare locations, with a maximum dollar-for-dollar match of $20 per day on their yes account. To increase SNAP customers’ access to fresh fruits and vegetables, SpartanNash and Fair Food Network are expanding the Double Up program this season. SNAP shoppers can now earn or redeem Double Up dollars on any produce at participating Family Fare stores, including Michigan-grown fruits and vegetables. Michigan produces a wider variety of fruits and vegetables than any other state in the country, other than California. Last year, 80 percent of all Double Up dollars earned at participating Family Fare stores by SNAP customers were redeemed. In 2014, SpartanNash became the first major grocery retail chain in Michigan to support the Double Up Food Bucks program. Since then, the company has invested more than $100,000 to ensure the success of the program, the majority of which was spent on refining point-of-sale systems to make it easier for SNAP shoppers to earn and redeem Double Up dollars for fresh produce. To date, SpartanNash has partnered with nearly 100 community organizations, including Grand Rapids Public Schools, Feeding America West Michigan, Spectrum Health Healthier Communities and the Heart of West Michigan United Way to inform communities – in both English and Spanish – about the Double Up program.